We're planning a road trip to the UK next month and have a couple of questions. I tried calling Budget at Heathrow but couldn't get through to speak with a person. Q1: I did rent a car in Leeds from Budget back in 2009 with a Washington DC license. Is that still possible or do I need an International Driving Permit? Q2: The quote I got on the web site for something like a VW Golf with unlimited mileage was something around 30 quid/day, which I thought was very cheap. But I don't think that includes all the charges, such as taxes etc. Approximately, how much total should I be expecting to pay? You are fine to drive on your licence for 12 months from the last time you entered the UK. If you moved here you'd have to pass a test to get a valid UK licence after 12 months, unless your licence was exchangeable which US one's are not. Seen as though you asked for the UK, the above only applies to Great Britain. The below applies to Northern Ireland. Provided your full licence or international driving permit remains valid, you may drive vehicles up to 3.5 tonnes and with up to eight passenger seats for up to 12 months from the date of coming to NI. With regards to question 2, taxes will be included in your price. Most things in the UK have tax included in the price unlike in the United States. When tax (VAT) is not included in products or services it is explicitly noted near the price. Other charges depends on what insurance you want, you may already have this in your travel insurance so you might not have to take it out. With regards to the price for this, it's different between cars and companies, you can usually check on the website when you purchase the rental. Budget let you add extra on like extended cover when you choose a car, so you know they price you will pay in the UK or online. As you can see in the image you can see the price of all the ad ons and it shows all the charges on the right hand side that are included in the price. Note although the rental is cheap the excess is a lot, you might notice this on other rental sites too. On Budget you can reduce it by adding extra vehicle cover. You can reduce the excess that you’d have to pay towards repairs or replacement of the vehicle significantly, or even completely, by adding Vehicle Cover or Vehicle Cover Plus to your booking. With our Vehicle Cover Plus option, we’ll include Roadside Assistance Plus (free support for breakdown assistance or common mishaps like flat batteries and locked-in keys). Please note I have no affiliation with Budget, just using them as an example and I use them regularly when I go over to the US. 30 quid a day is about average from a location like Heathrow. This includes taxes and basic insurance (although the excess amount can be quite large, often £1000). You can compare prices for car hire on comparison sites (I usually check RentalCars before comparing directly with the individual companies' own websites) but I would recommend sticking to the well-known rental brands. Some of the lesser-known brands which are cheaper require larger deposits and have higher excess charges should something go wrong. Incidentally it's worth checking with your credit card company to see if they include car hire insurance, otherwise I would advise taking out a policy. These can be had for a few pounds a day or around £40 for an annual policy. Remember to bring proof of your home address! On several occasions while renting a car I've seen people refused a car because they didn't have proof of their home address. Not the answer you're looking for? 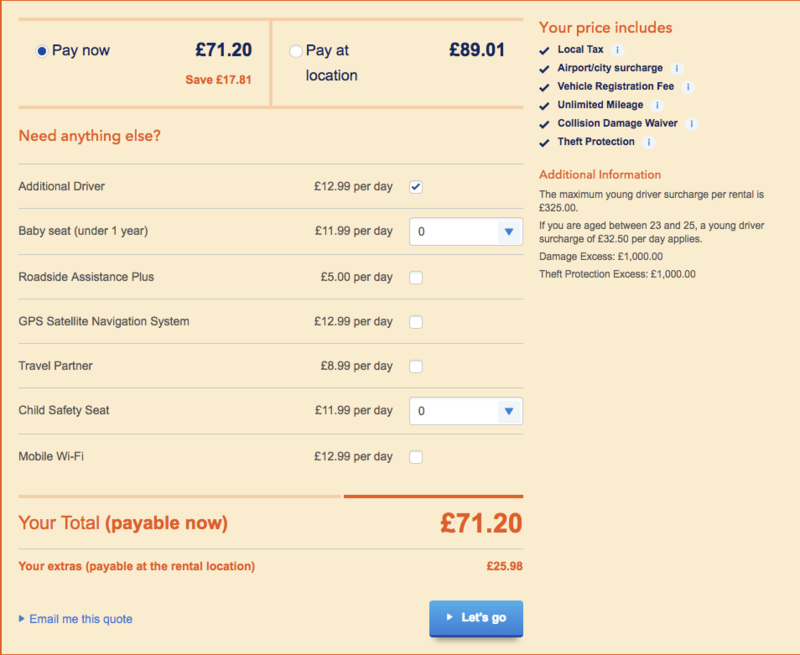 Browse other questions tagged uk car-rentals driving-licenses fees-and-charges or ask your own question. What are the rules for renting a car in Italy?